Paul Edgar Philippe Martin Jr.
Business, Canadian Politician, Prime Minister. 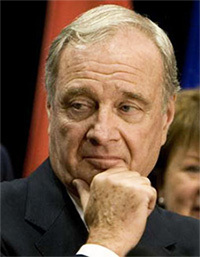 Paul Edgar Phillippe Martin Jr., more commonly known as Paul Martin Jr., is a Canadian politician. He was born August 28, 1938 in Windsor, Ontario and is best known as having been the Prime Minister of Canada from 2003 to 2006. Martin, who was raised in Windsor, moved with his family to Ottawa in 1946. He went on to receive a degree in philosophy from St. Michael’s College at the University of Toronto. From there, Martin obtained a law degree from the University of Toronto in 1965 and, in 1966, was called to the Ontario Bar. Prior to entering politics, Martin established a strong business career. He moved to Montreal in 1966 and worked for the Power Corporation of Canada. Martin became the CEO of Canada Steamship Lines in 1973 (which, at that time, was owned by the Power Corporation of Canada). Martin and a business partner purchased the company in 1981. Martin’s political career began in 1988, when he became a member of Parliament in the Montreal riding of LaSalle-Emard. Martin ran for leadership of the Liberal Party in 1990 but lost to Jean Chrétien. He was then made Minister of Finance in 1993, a position which he held until 2002. When Chretien retired in 2003, Martin was elected as leader of the Liberal Party (November 14, 2003) and was sworn in as Prime Minister on December 12, 2003. He stepped down as leader of the Liberal Party in early 2006 after having lost the election to the Conservative Party. However, Martin remained a member of Parliament until 2008. Martin has written several books, including a memoir entitled Hell or High Water: My Life in and out of Politics (2008) and Canada and Aboriginal Canada Today: Changing the Course of History (2014). Chodos, Robert. (1998). Paul Martin: A Political Biography. Toronto: J. Lorimer. Gray, John. (2003). Paul Martin: The Power of Ambition. Toronto: Key Porter Books. Martin, Paul. (2014). Canada and Aboriginal Canada Today: Changing the Course of History. Charlottetown, PEI: Confederation Centre of the Arts; [Ottawa]: University of Ottawa. Martin, Paul. (2008). Hell or High Water: My Life in and out of Politics. Toronto: McClelland & Stewart. Paul Edgar Philippe Martin – Canada’s 21st Prime Minister. (n.d.) Library and Archives Canada.